It's always a peculiar kind of joy to me to find out I wasn't understanding something correctly. I know, it's an odd thing to get excited about, but I find the process of refining my comprehension of the universe to be a thrill. I vividly recall when my freshman physics teacher demonstrated via a clever apparatus that if you shoot a gun horizontally, and simultaneously drop a bullet from the same height, the two bullets hit the ground at exactly the same time. It didn't seem possible, but I couldn't argue with experimental evidence right in front of my eyes; the vertical and horizontal components of velocity are completely independent of each other. And my picture of the world shifted a little bit. Here's another one: how many of you have heard that before the dinosaurs became extinct when the Chicxulub Meteorite hit 66 million years ago, all the lineages related to mammals were small and fearful, scampering about in the shadows to avoid the fierce "terrible lizards" at the top of the food chain? Any primitive mammals that grew too large, the story went, would either (1) be turned into lunch, or (2) be stepped on and converted to a Primitive Mammal Pancake. Well, check off another piece of conventional wisdom as "refuted." Because a recent discovery near the town of Lisowice, Poland, dating from the Late Triassic -- 220-odd-million years ago, right as the dinosaurs were approaching their peak -- shows that during this time, which was quickly leading up to the all-time-record-holders for terrestrial animals, behemoths like Brachiosaurus, Diplodocus, and the aptly-named Giraffatitan, there were already cousins to the lineage that led to mammals that were the size of African elephants. 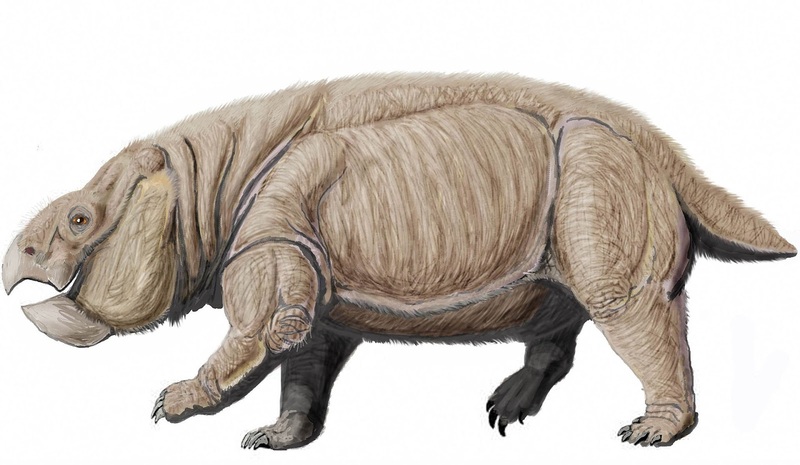 Lisowica is so large, said Tomasz Sulej, paleontologist at the Polish Academy of Sciences's Institute of Paleobiology in Warsaw, that at first he and his team didn't recognize it as a dicynodont. Its estimated mass is nine tons -- as much as a full-grown male elephant. "Who would have ever thought that there were giant, elephant-sized mammal cousins living alongside some of the very first dinosaurs?" said Stephen Brusatte, a vertebrate paleontologist at The University of Edinburgh. "We've always thought that early mammals and their relatives retreated to the shadows while dinosaurs rose up and grew to huge sizes. That's the story I tell my students in my lectures. But this throws a wrench into that simple tale." But that's what's cool about science, isn't it? You think you get what's going on, and nature turns around and astonishes you over and over. So picturing the prehistoric world dominated by T. rex and Triceratops and the rest of the big, lumbering creatures popular in children's books, with our cousins all the size of mice scurrying around and hoping not to get noticed, needs to be revised. Right smack in the middle of the Age of Reptiles was a close relative of ours who looks like he was ready and able to defend himself. And maybe even turn some of the smaller dinosaurs into Dinosaur Pancakes.